When it comes to state accountability reporting, the name of the game these days seems to be “user-friendly.” A newly launched online toolkit for instance is making data on schools in Florida (and beyond) easy to find and interpret through the use of interactive data visualization tools. Under the Every Student Succeeds Act (ESSA) framework, states are required to provide more school-level data by highlighting indicators such as student performance, funding, teacher quality and more in their report cards. Additionally, they are asked to make school accountability reporting more accessible and “parent-friendly,” since many are outdated and incomplete. The Foundation for Excellence in Education (ExcelinEd), an education reform nonprofit launched by former Florida Gov. Jeb Bush, has been “exploring what it takes to build a next-generation public school accountability reporting tool,” according to a recent report. 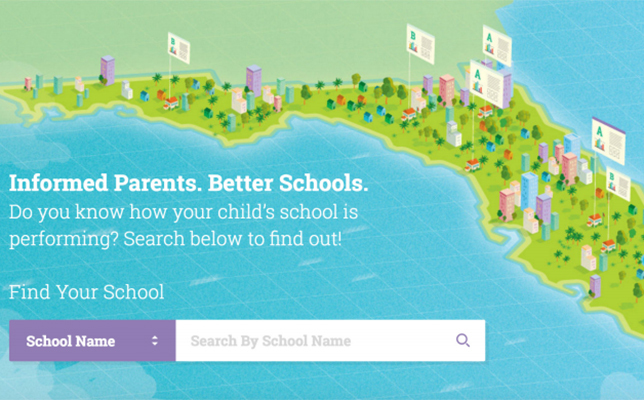 Today, the nonprofit launched KnowYourFloridaSchool.org, a live prototype online school report card, as part of its national Know Your School Project that promotes the transparency of school performance data. The Know Your Florida School site features information specific to the Sunshine State, but ExcelinEd has made its code open source on GitHub, so that developers in other states can advance their own efforts to build online school report card tools. Virginia recently launched a similar resource called School Quality Profiles, an online data tool that clearly communicates the status of the aforementioned topics but for Virginia’s public schools. ExcelinEd was launched in 2008 and provides model legislation, implementation strategies and other public outreach services. To learn more, visit the ExcelinEd site.